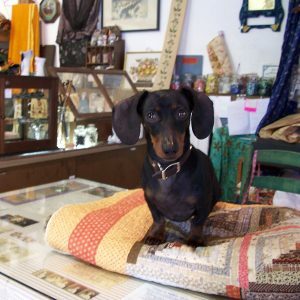 Vintage & Antique Textiles opened for both retail and wholesale business in September, 2000. After 20 years of designing for the textile industry and the death of a dear friend, the shop was an experiment in my love for pattern, the need for a life-change and a retail space needing a tenant. My husband, Tom and I own the complex of stores at 538 Main Street and Tom’s leather shop, Best Bib & Tucker adjoins Vintage & Antique Textiles. Activity in the shop tends to be seasonal, following the Brimfield schedule and in the off-season, visitors may sometimes be directed to “Enter Through the Leather Shop”. The shop is well-organized and customers are encouraged to ‘poke’. A comfy chair is available for husbands and good friends, as ‘poking’ can often take the better part of an afternoon. The shops are a family affair and Tom often acts as the ‘textile guy’ in my absence. During the Brimfield season, all hands pitch in to get through the rush. Things do change, however. The two little girls who used to complain bitterly about having to spend Saturdays at ‘mom’s shop’ are now grown. We enjoy antiquing together and I have found their younger ‘eye’ to be a great help with purchasing as the shop transitions through its second decade. With that said, we hope you’ll visit soon to check out our many new discoveries!